A Steinberger with a headstock? You bet! By the late 80's popular culture had decidedly moved away from the "technology" revolution of earlier in the decade. Hard rock was firmly established as a predominant musical genre in pop music, and heavy metal guitars were all the rage. Gibson had seen sales of Steinbergers drop and wanted a new guitar to compete with the Ibanezes and other Japanese imports in all the music stores. Steinberger's answer was the GS. A pair of GS7's. The one on the left has a TransTrem; on the right a Z-Trem. Only offered as a guitar they came with a Steinberger-blend neck equipped with a reverse style headstock - the first and only headed Steinberger instrument. Ned also designed new innovative gearless tuners which allowed for precision tuning as well as a clean look. 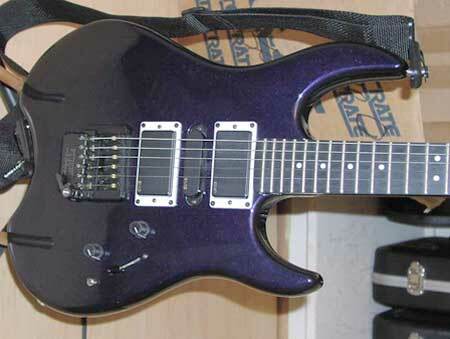 This neck was mated to a strat style body. Instead of fully routing the body where the bridge tuners usually were, the body was curved in slightly at the bridge end, giving it even more of a traditional look. Body woods varied quite a bit, with the first ones featuring poplar. Later choices consisted of swamp ash, lacewood and walnut. We've even confirmed a batch made from solid koa, which imparts an impressive sound with an equally impressive weight. The GS bodies came decked out in many popular metallic colors (popular for the day anyway) which were actually an automotive paint adapted for use on wood. This included the standard black, white and red colors as well. Ned went on to design two bridges specifically for the GS. Both were traditional knife edge bridges: the Z-Trem was first, followed by the Jam Trem. The TransTrem was also offered but with several modifications including the removal of the bridge tuning knobs and an extended spring tension knob. Many owners claim TT equipped GS's actually offer the most reliable transposing of all Steinberger models. Little did Gibson foresee the coming of grunge in the early 90's. This moved the interest towards older more "classic" guitars (lucky for them it included their signature guitar, the Les Paul), so the GS never really hit it's stride here in the US. Over half of the GS's sold went overseas (notably to Japan and Australia). Thought there were many revolutionary features on the it, it was too little / too late to make much of an impact. This was the last new model introduced before Gibson closed US graphite production in Nashville in 1998. 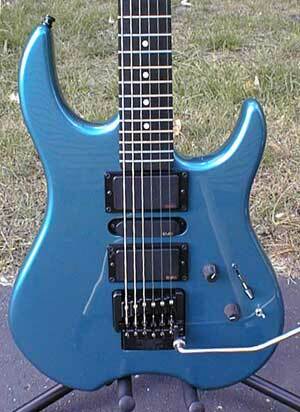 Though Steinberger has begun USA graphite production again there are no plans to reintroduce this model.